Home / Archive by Category "Wedding Cakes"
In years past you would never have seen a wedding cake with color other than the flowers, accents or possibly a little bit of color detail on the cake tiers for those that live fast and wild! 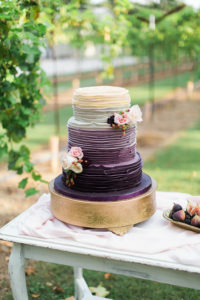 Forward 20 years to present, there is color on cakes in all types of design: scrolling, fondant draping, single tiers of cake or in this picture a full hombre of color. 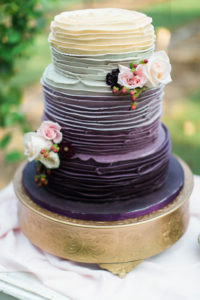 When thinking about doing this style of cake here are a couple of things to consider. First, the darker the color of buttercream the better the pictures for the photo booth! You can have fabulous “smurf” mouth in blue or go for “Shrek” in the colors of green! 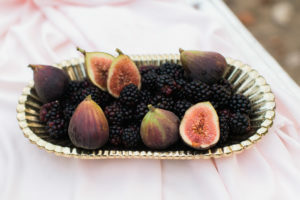 Going for the lighter colors is romantic and elegant and even if you want more dramatic, consider that layer being a fake layer with the servings you need in the kitchen. We find most adults at events will not eat the dark color buttercream for fear of having teeth and lips that look like Barnie the Purple Dinasore! Don’t get me wrong, using color can be fabulous! …but it needs to be purposed the right way, bringing elegance to the event and not steering more to a birthday day party type of idea. Popular colors that are gorgeous in hombres are white to a light khaki or tan, off-white to blush, pale yellow to a darker yellow, ivory to pale peach and even tan to a light green is really stunning for weddings that are natural and full of greenery. Keeping the lighter color on top and the darker color on the bottom will also create a vision on balance and proportion keeping the darker colors grounding the lighter colors. Depending on the texture, consider tying it together with a bouquet of assorted fresh flowers to match the wedding bouquet or centerpieces. 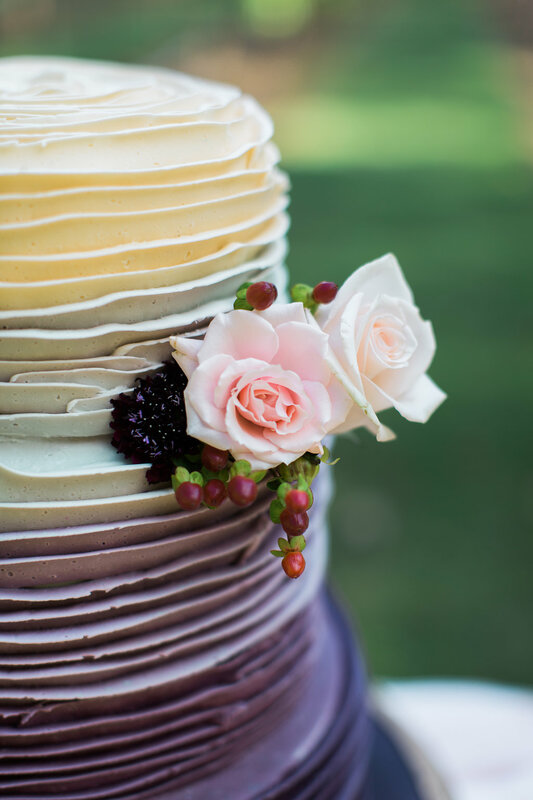 Just keep in mind the colors and your wedding cake will be one to keep people talking!